Tata showcased the Nexon AMT at the 2018 Auto Expo with the promise that the car will be coming to the market very soon. 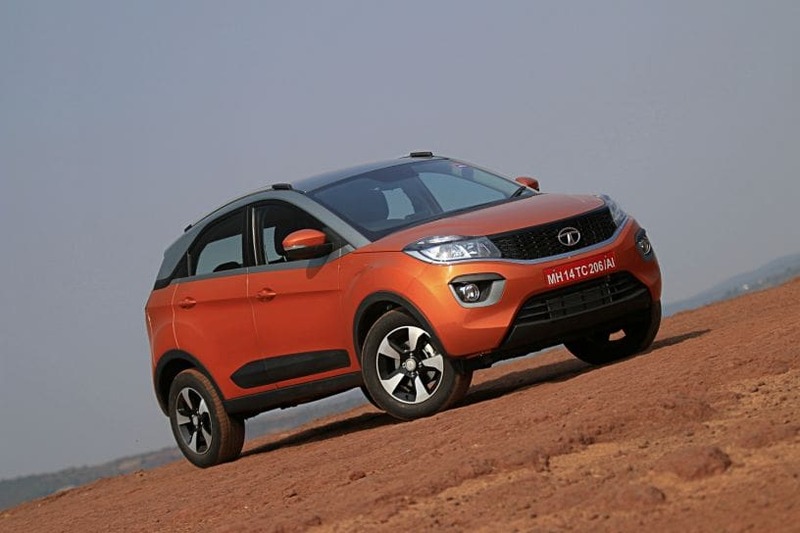 Like everyone else, we were excited and a bit apprehensive to see what Tata does with the AMT variants. Excited because it would be the first compact SUV in the segment to offer an AMT with both its petrol and diesel engines, and apprehensive because, frankly, AMTs have always been a bit of a trade-in on driving dynamics in favour of convenience. The Tata Nexon AMT looks exactly the same as the manual variants. The humanity line is still in place along with the prominent front grille and strong shoulder line painted the same colour as the roof. The only differentiating factor is the “XZA+” badge on the tailgate. The AMT variants will also be launched in the striking Etna Orange colour and Tata will be introducing the shade to its manual variants as well. The cabin too is identical to the manual variants. The 6.5-inch Harman infotainment system continues to come with Android Auto compatibility (Apple CarPlay still unavailable). The touch function is intuitive, but does have slight delays between input and execution. The cabin feels well put together and despite the lack of soft feel materials, it feels high quality. The major difference is the AMT gear lever in the centre along with the drive mode selector placed behind it. The cabin still retains its spaciousness, with ample knee room available in the second row even with the front seats placed all the way back. How different is the AMT? Let’s start with the petrol first. There is no change in the power outputs between the manual and AMT variants. The 1.2-litre Revotron petrol motor still makes 110PS of max power and 170Nm of peak torque at 5000rpm and between 1750-4000rpm respectively. The AMT gearbox sourced from Magnetti Marelli employs the same 6-speed ‘box as its base as the manual version, with identical gear ratios. So essentially, the gearbox is exactly the same with the exception that you no longer have to shift the gears yourself. When we drove the manual version last year, we found the petrol to be fun to drive when driven enthusiastically, but a bit of hard work while commuting. The manual needed you to constantly play with the gears to get anywhere, as the lag around 1500rpm was noticeable. But that flaw seems to have been corrected with the AMT. Tata seems to have fiddled around with the throttle map which has helped in reducing the lag that was quite noticeable in the manual gearbox-equipped versions. The power delivery is much smoother now and getting off the line is much easier as well. There is ample torque available low down and you don’t need to wait for the turbo to kick in to really get going. Also, the head nod is still there when the system shifts a gear but it is far from annoying. That said, you will need to modulate the throttle and not treat it as a traditional AT gearbox. The gearbox comes with three driving modes which can be toggled through via a dial mounted behind the gear lever. The three modes are Eco, City and Sport, and all three have their own characteristics. Eco mode is self explanatory and is tuned towards fuel efficiency than anything else. Use it if you want to drive calmly in the city or enjoy a relaxed cruise on the highway @ 80-100kmph. The throttle response is quite relaxed and the gearbox shifts up the moment the needle touches the 2000rpm mark. Also, do not expect to perform any quick overtakes in this mode. City mode is more suited to city commuting and provides slightly more urgent power delivery, like you would need in the city for overtaking and commuting. But if you want to drive enthusiastically, turning the knob all the way to the right puts the car in Sport mode and you get all of the power and torque on tap, and the difference is noticeable. Sport mode allows you to hold a gear for longer and rev higher. There is no change in the speed of shifts, but the power delivery feels more immediate. For full manual control, you can even use the tiptronic mode which has a default sport setting. Rolling off the throttle slightly while shifting up reduces the head nod by a fair margin. The car feels light on its feet and you can have some fun on the twisties. There are a few issues, however. For instance, there is a fair amount of judder from the 3-cylinder engine while rolling off the line and at crawl speeds. Plus, even the Sport mode is set up on the conservative side and the gearbox automatically shifts up as soon as you hit the redline. So it’s not going to please any enthusiasts, but it’s nothing unexpected. Having said that though, the Nexon can sit on the highway at 100kmph with the needle nudging 2000rpm and at 80kmph with the needle firmly at 1500rpm. The diesel engine too produces identical power and torque figures of 110PS (same as the petrol) and 260Nm at 3750rpm and between 1500-2750rpm respectively. The diesel is a treat to drive and overcomes all the shortcomings that we felt are on the petrol variant. The power delivery is smooth and there is virtually no lag right from the get go. Even the shifts feel smoother, almost AT-like thanks to the relentless supply of torque on tap. The diesel is a proper highway cruiser and just like the petrol, can maintain 100kmph sitting at 2000rpm and 80kmph sitting at 1500rpm on the highway. Though, under braking it does feel heavier due to the added weight. But at the same time, the front feels more planted, thanks to the same. It still tends to roll back on inclines a little before the ‘hill assist’ kicks in. Hill assist is essentially the creep function and doesn't engage the brakes at any point, so the use of brakes is strongly recommended. You need to be gentle with the shifts and the throttle when driving enthusiastically as a heavy foot does tend to confuse the gearbox at times, again, especially, on inclines. Otherwise it is a hoot to drive in the twisties, even with a full load on board, luggage included, and rarely feels out of place in the corners. The ride of the Nexon was always good and nothing has changed here. It is still great and the car absorbs all undulations with ease. There is a bit of body roll but it isn’t uncomfortable. The petrol does feel lighter to drive and more eager to change direction, but the diesel is the more enthusiastic of the two, thanks to the added torque and a more planted front end. The steering lacks a bit in feel but is responsive enough to make driving it fun. The Nexon AMT is a great overall package and if you are considering a petrol Nexon, we strongly recommend you go for the AMT variant instead of the manual. Yes, it will come at a premium of Rs 40,000 - 45,000 but it will be worth the extra cost as it doesn’t trade in the fun factor entirely for convenience. As for the diesel, it is a properly sorted car and when you add the smoothness of power delivery, a fun drive and the convenience of a well-tuned AMT powertrain, it makes the deal that much sweeter.